A petition drive run by SumOfUs.org, seeking to collect signatures prior to Apple's shareholder meeting today, has removed a primary claim it alleged against the company, substituting other deceptive wording after collecting tens of thousands of names with its original, very misleading allegations. The original wording of petition that SumOfUs.org distributed described described "a young girl" who "spends those hours inhaling n-hexane, a potent neurotoxin used to clean iPhone glass, because it dries a few seconds faster than a safe alternative. After just a few years on the line, she will be fired because the neurological damage from the n-hexane and the repetitive stress injuries to her wrists and hands make her unable to continue performing up to standard," it said, in wording that continues to appear on the web. The petition's claims that suggested Apple requires workers to use the toxic chemical n-hexane to clean iPhone screens because it is "faster than a safe alternative" were actually derived from Apple's own Supplier Responsibility report, which in reality documented action the company took to stop the use of the chemical last year. Wintek, the company that had used it, ended up paying workers for serious damages they suffered after violent riots broke out in protest over the issue. Taren Stinebrickner-Kauffman, an executive director of SumOfUs.org, stated in a press release today that Apple has a moral obligation to fully compensate workers like Guo Rui-Qiang and Jia Jing-Chuan" who were exposed to the chemical by Wintek, and said Apple had "to take the hard steps required make sure that tragedies like this never happen again, despite Apple's published report documenting that it had already required Wintek to take preventive action. Apple noted in its public report earlier this year that "we required the facility to discontinue use of n-hexane, to fix the factorys ventilation systems, and to implement improvements to their management systems for Environmental Health and Safety." 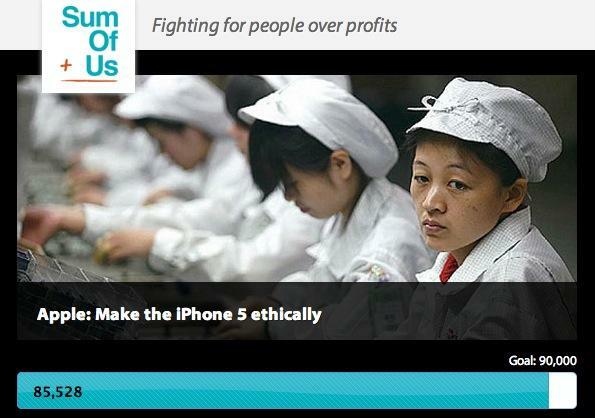 After collecting tens of thousands of signatures, SumOfUs.org quietly changed the wording of the petition to read that the young worker "spends those hours inhaling isopropanol, a toxin used to clean iPhone glass. After just a few years on the line, she will be fired because the repetitive stress injuries to her wrists and hands have made them useless." (Emphasis theirs). The petition not only drops alleged claims of the continued use of n-hexane, but substitutes "isopropanol," which it describes as a "toxin," despite it actually being the chemical name of common "rubbing alcohol," something that American parents commonly use to sterilize the ear piercings of their young children. Alcohol was also the "safer alternative" that SumOfUs implied Apple refused to use to save time at the expense of worker's health. The petition continues to state that repetitive stress injuries alone would cause a worker to left with "useless" hands and wrists, a claim originally tied to toxic exposure with n-hexane, which actually can cause neurological damage. SumOfUs.org has advertised efforts to organize a protest at the Apple campus this morning, asking for "visuals" to include "Apple consumers dressed as iPhones, with Apple products and posters echoing Apples taglines (e.g., 'iWant An Ethical iPhone')." SumOfUs.org is coordinating its campaign with Mark Shields, who portrays himself as a concerned Apple customer but who is actually a director at the Washington DC based Spitfire Strategies, "a consulting firm offering advice on strategic communications and campaign planning for a wide range of non-profits and foundations," which describes itself as "dedicated to helping nonprofits and foundations create and implement high impact communications programs to achieve their social change goals." Rather than focusing on n-hexane, Shields' independent petition, run by Change.org, demands that Apple "release a worker protection strategy for new product releases," alleging that the company's product scheduling results in spikes of repetitive stress injuries and suicides, despite being unable to offer any data to back up the claims.